For some patients taking statins, add-on therapy may be needed to achieve optimal low-density lipoprotein cholesterol (LDL-C) levels to reduce the risk of coronary heart disease (CHD). Previous research has indicated that consuming >50g of almonds daily can lower LDL-C levels and a new study is the first to examine the lipid-lowering effects of almonds in patients on a statin regimen. Forty-eight patients ages 18–78 on a consistent statin dose for at least eight weeks prior to study entry were randomly assigned to the almond or control group; those in the almond group were instructed to consume 100g of raw unsalted almonds from preweighted individual packages each day. The overall diets and physical activity levels for both groups were also reviewed. After four weeks, no significant changes in weight, body mass index, or physical activity were noted between the two groups but the almond group had an average non-HDL-C decrease of 4.9% from baseline vs. a 3.5% increase for the control group. 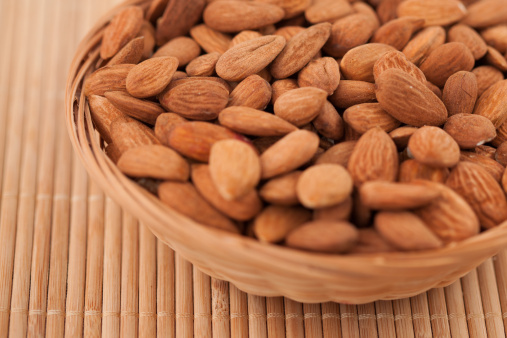 Very-low-density lipoprotein (VLDL) levels increased by 12.7% in the control arm but decreased by 3.3% in the almond one. LDL pattern type also changed from pattern A to pattern B in those consuming almonds. These changes were observed despite overall higher daily energy intake and greater daily intake of saturated and total fat in those consuming almonds daily. Although additional research is needed, the significant reduction in non-HDL-C and shift in LDL-C pattern indicates that almonds may benefit patients on statin therapy to further reduce LDL-C levels and the risk of CHD. Dietary supplementation with almonds has demonstrated dose-dependent decreases in low-density lipoprotein cholesterol (LDL-C), likely because of their composition of beneficial nutrients including mono- and polyunsaturated fatty acids, fiber, and protein.